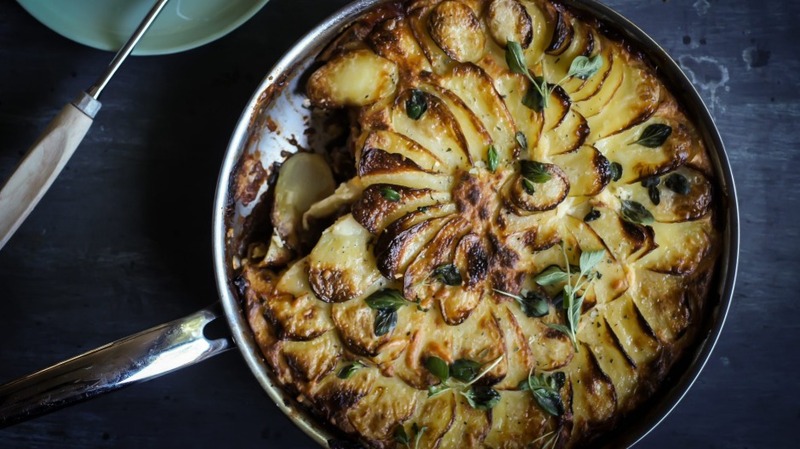 Gratin would have to be one of the most spirit-lifting carb creations in existence. There is so much to love about a dish that is simultaneously so humble and luxurious. 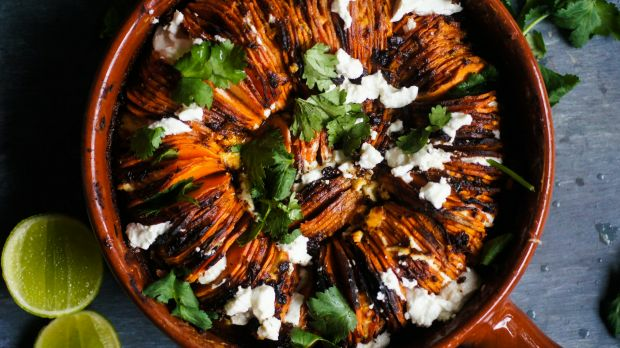 Here are two twists on the classic side dish. A hybrid of two of the world's greatest comfort foods. Heavenly as a side to some slow-cooked Greek lamb or as a standalone vegetarian meal. The key to getting crisp, cooked-through potato for this gratin is to slice waxy fleshed potatoes so thin you could almost see through them. This way they sit on the bechamel rather than sink into it and you get that glorious differentiation between the layers. 1. Heat the oil in a large ovenproof frypan over medium-high heat. Add the onion and garlic and stir occasionally until golden (seven to 10 minutes). 2. Add tomato paste and stir continuously for two minutes, then add stock, tomato, wine, cinnamon, fresh oregano and half a teaspoon of dried oregano and bring to a simmer. 4. Preheat the oven to 170C (160C fan-forced). 5. To make the cheese sauce, add the butter to a saucepan over medium heat and swirl until melted. Add the flour and whisk frequently until combined (one to two minutes). Add milk in batches, stirring well after each addition, until all the milk is incorporated, then stir occasionally until thick (three to five minutes). Remove from heat, stir in the two cheeses and egg yolks, the half teaspoon of nutmeg and season to taste. 6. Pour the cheese sauce over the eggplant mixture and spread evenly to create a flat surface. 7. Allow to cool slightly before adding the potato, arranging and overlapping the discs in an even layer. Sprinkle with a pinch each of dried oregano and nutmeg, place in the oven and cook for approximately one hour. For the final 15 minutes, turn on the grill top function to help crisp the top of the potatoes. Keep a close eye on them during this time to ensure the potato doesn't burn. 8. Remove, scatter with extra oregano leaves and serve hot. I love the charred crunch on this sweet potato gratin, achieved by drizzling over the maple and spice mixture rather than rubbing it into the potato slices prior to assembly. If you prefer a more consistent result feel free to toss together the sliced sweet potato and marinade ingredients in a bowl before roasting. You can layer the potato vertically (pictured) or from the bottom up. Placing the potato vertically maximises the crunch factor. 2. In a large bowl whisk together the olive oil, maple syrup, lime juice and zest, and the spices. 3. Rub a 20cm-diameter round earthenware dish with a little butter then layer or arrange the potato slices, seasoning with salt as you go. Spoon over the oil, maple and spice mixture, like you would with a salad dressing. 4. Roast in the oven for 45 to 55 minutes, checking regularly from the 30 minute mark. Gently poke a fork into a potato slice – if you are met with any resistance, continue to cook for additional 10 minutes, then check again at 10 minute intervals. If the top is taking on too much colour, cover the dish tightly with foil and return to the oven, before removing the foil for the last five or so minutes of cooking time. 5. Remove from heat and scatter over the feta, pushing some pieces between the slices of potato so they melt. Top with coriander, season with salt and pepper and serve.